Well, there's no need to beat a dead horse about the trading card company practices in the 1990's. But one thing that came out of the decade for the collecting industry beyond eBay, was Upper Deck SP Authentic. Starting in 1993, with Jerome Bettis and Drew Bledsoe, the brand got off to a solid start. Eventually, in 1998 the set reached it's peak, and is arguably the top set of the decade, in a rough 10 years for collectors. 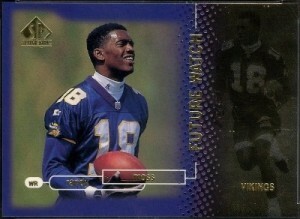 In any case, the set has two entries in our Top 5 rookie cards of the 1990's. Click the title to see them on eBay. There may be other cards that could be on this list in place of Davis, but in it's heyday this card was a staple. Davis had the best four-year start to a career in history, capped by winning the 1997 Super Bowl MVP and becoming one of a handful of players to rush for 2,000 yards a season. He is still on the outside looking in to getting a bust in Canton, but its remarkable that he still has a chance to make the Hall of Fame after such a short career. This card still commands a respectable $75 for a GM MT 10, but his cards fall in the same realm as his career....what if?! As mentioned, this set is probably the highlight of the 90's. In just 2 short years in the league, Randy accounted for many of the highlights of the 90's at a young age. He made an immediate impact on the league from the wide receiver position, something that is rarely done. While he has a few other cards out there that are more valuable, the 1998 SP Authentic stands out as the staple amongst all of his cards. An enigmatic character throughout his career, he's earned a place amongst the greatest of all-time and will surely be in the Hall of Fame once he finally hangs 'em up. Annoying or not, this card has been consistently trafficked over the years. This card is almost as annoying as Favre's retirement antics at the end of his career. It would just never go away. From the moment that Favre burst onto the scene with the Packers, this card has been everywhere. And it has always held in strong demand. Whether you were ripping open packs in a shop in the early 90's, or buying graded cards in the 2000's, Favre's 1991 Stadium Club was bound to be available and heavily traded wherever you were. You have to give it to Favre. He had staying power in every sense of the word, and this card typifies that. Thankfully the supplement set exists. Without it, we're stuck with some pretty paltry options for the smooth Cowboys great. A PSA 10 Emmitt Smith 1990 Score Supplement can command from $250-$350, which is saying something for a card from the early 90's. Regardless of the number of copies that exist of this pristine RC, there is only one Emmitt Smith. This card may well end up at the top of this and a couple more lists when it is all said and done, but for now he lands here. Peyton's resurrection in Denver has proven what we've already known, that he's a legend. For now, this card commands between $1,000 and $2,500 for a BGS 9.5. The only question is, where does this card lie amongst the all-time great QB cards of all-time?